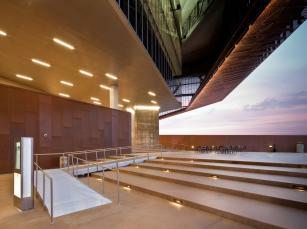 The Irving Convention Center has achieved LEED®Silver certification by the U.S. Green Building Council. This certification acknowledges that the design, construction and operational processes at Irving Convention Center help save energy, water and other resources. Innovative in its design and approach to meetings, the Irving Convention Center at Las Colinas addresses the environmental standards required by so many organizations today. The facility is indeed a departure from the traditional, institutional big box. The ability to move fluidly within spaces and the creation of interesting places to interact with colleagues and clients have guided its design as much as a respect for the environment. 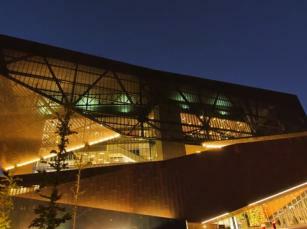 The Irving Convention Center's dramatic exterior is made of unfinished copper. The natural copper "skin" wraps the building's exterior and creates a dynamic, changing appearance to the building thanks to graduated perforations in the material that create transparency as light shines through. The copper panels will weather gracefully over time, aging to a beautiful green patina. Utilizing this natural material ensures that no chemicals or paint will be needed to maintain it. The perforated pattern of the copper panels also provides a cushion of cooling air to reduce the air conditioning demand. Many of the materials used in the interior finish out, while exceptionally high-end, are constructed of either recycled or locally sourced materials. The vertically stacked layout, in addition to the copper paneling, allows the building to shade itself and its outdoor patios, while utilizing a much smaller footprint of land than a traditional facility, creating efficiencies not only in land use, but in servicing events. The building's vertical approach also makes it highly efficient for event attendees, allowing for seamless movement between events. An integrated parking garage reduces the amount of asphalt required for surface lots; the garage anchors the building's west side, providing another mechanism to soften solar impact. The building's light-colored roof helps to reflect heat from the sun. Our energy partner, TXU, provides a green electricity plan that complements the facility's extreme energy efficiency. The Irving Convention Center buys back 100% Green-e Certified Renewable Energy produced in Texas. A unique water treatment system filters water from nearby Lake Carolyn, lowering the building's water usage. By utilizing water from nearby Lake Carolyn, more than 90% of the building's water requirements are met with water re-used for landscaping and other non-potable applications, including the building's cooling systems. The landscaping design includes drought-resistant native plants that require minimal watering. A dense canopy of trees on the plaza will offer a cooling shade while reducing the ambient temperature. Our building management and operations processes aim to further minimize the facility's footprint by purchasing locally produced and sustainably raised products, using non-petroleum-based products, and recycling and composting all waste whenever possible.